John Furniss, Invision/APAaron Paul (left) and Dominic Cooper at the U.K. 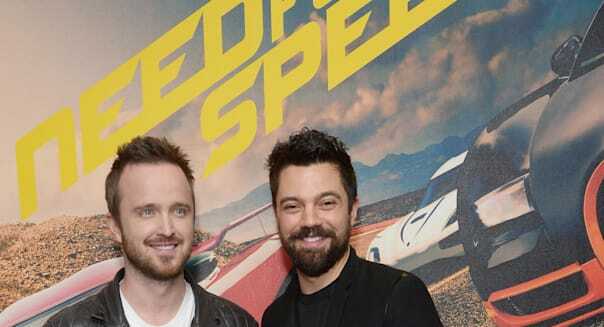 Screening of "Need For Speed," which opens at U.S. theaters Friday. You can never know in advance all the news that will move the market in a given week, but some things you can see coming. From a maker of decadent doughnuts stepping up with hot financials to the latest video game franchise to get the Hollywood treatment, here are some of the things that will help shape the week that lies ahead on Wall Street. The trading week kicks off with Urban Outfitters (URBN) dressing up for its latest quarterly report. This will be a big report for the retailer of trendy apparel since it covers the seasonally potent holiday period. Analysts see a profit of 55 cents a share out of the chain, roughly in line with what it earned a year earlier. The same pros see revenue climbing 8 percent for the quarter. Diamond Foods (DMND) is a nutty company, and not just because it's the company behind Emerald snack nuts. The company -- which also puts out Kettle potato chips and Pop Secret microwaveable popcorn -- is just starting to bounce back from an accounting scandal that ended earlier this year with a $5 million settlement to put an end to fraud charges from the Securities and Exchange Commission. The timing for the irregularities was cruel, forcing Diamond Foods to forgo the planned purchase of the Pringles potato chip line. Now it may have to sell its Kettle line to raise money. There's a "when the chips are down" punchline in there somewhere, but we'll see if Diamond Foods discusses any potential asset sales when it reports financials on Tuesday. When it comes to doughnuts, it's hard to top the fried delicacies that Krispy Kreme (KKD) creates. You don't even need to have one of its doughnut shops nearby since it has a wide distribution net. Krispy Kreme reports on Wednesday afternoon, and Wall Street sees profitability improving to 13 cents a share in its latest quarter. It checked in with net income of just 9 cents a share a year earlier. Sales aren't growing as quickly, but it's always refreshing to see margins expanding alongside waistlines. Vanity never takes a holiday. Cosmetics, hair salons, and beauty parlors tend to hold up better than other consumer-facing industries when times are tight, %VIRTUAL-article-sponsoredlinks%and now it will be time to see how one of the leading beauty salons dolls itself up. Ulta Salon (ULTA) reports on Thursday. It has routinely blown past analyst profit targets, but it stumbled in its most recent quarter. This will place more pressure on Ulta to get back on track by beating the $1.07 a share that analysts see it earning in Thursday's report. Video games have been providing content fodder for Hollywood in recent years. Some franchises have included "Tomb Raider," "Resident Evil" and "Silent Hill." On Friday we'll see if what has worked out generally well for action and horror flicks will pan out for driving titles. "Need for Speed" opens in theaters over the weekend, based on the most successful racing video game franchise of all-time, with more than 140 million games sold. The big companies behind it are DreamWorks (DWA), Electronic Arts (EA) and Disney (DIS). It comes at a time when the "Fast and Furious" franchise has lost its lead actor, so it will be interesting to see if movie buffs show up to the starting line. Motley Fool contributor Rick Munarriz has no position in any stocks mentioned. The Motley Fool recommends Ulta Salon, Cosmetics & Fragrance and Urban Outfitters. The Motley Fool owns shares of Ulta Salon, Cosmetics & Fragrance.